The documents, obtained by a Freedom of Information lawsuit filed by the American Civil Liberties Union and released Tuesday, reveal the vehicle surveillance system collects over a hundred million license plates a month from some of the largest cities in the U.S., including New York and Los Angeles, both of which are covered under laws limiting police cooperation with immigration agencies. More than 9,000 ICE agents have access to the database, run by Vigilant Solutions, feeding some six billion vehicle detection records into Thomson Reuters’ investigative platform LEARN, which police departments can buy access to. ICE has a “hot list” of more than 1,100 license plates of suspects, felons, or other subjects of interest, according to the documents released. Plates on the hot list trigger an alert to ICE agent that the vehicle has been spotted, including where and when. It’s the third effort by ICE to secure access to the database in the past five years, after earlier attempts in 2014 over privacy concerns and 2015 over price negotiations failed. The agency rushed to secure the contract before a planned hike in cost by Thomson Reuters towards the end of 2017. ICE spent $6.1 million on its latest contract in February 2018, gaining access to 80 law enforcement agencies covering almost two-thirds of the U.S. population. To allay fears of potential misuse, the agency was required to pass a revised privacy impact assessment explaining how ICE can and cannot use the license plate data. In one released email to an NPR reporter, ICE said agents “can only access data” uploaded by police departments if they elect to share through the system. Over a years-long effort, one ICE agent — whose name was redacted by the government — sent several requests to a La Habra police detective by email for asking for license plate data. We asked Jerry Price, chief of police at La Habra Police Department, if turning over records to ICE was in violation of California’s sanctuary status but would not comment. 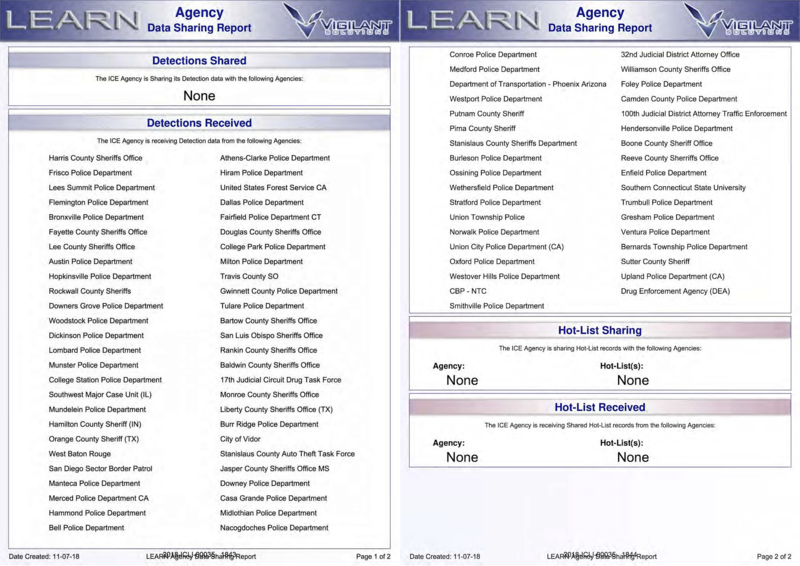 Other police departments were named as partners that actively feed data into the ICE-accessible database, like Upland, Merced, and Union City — three cities in California, which in 2018 passed state-wide laws that offer sanctuary to immigrants who might be in the country illegally or otherwise subject to deportation by ICE. The laws prohibit law enforcement in the state from sharing of license plate data with federal agencies, said Talla.